This article originally appeared in the Union Recorder. MILLEDGEVILLE, Ga. — Decades come and go, yet many parts of downtown Milledgeville remain the same. One such place that has remained is Ryals Bakery. While there has been a city bakery since the early 1900s, a man named Kirkpatrick bought a bakery in 1956 and named it Kirkpatrick’s Bakery. A few years later, he hired Jacob Ryals, a fresh-faced 22-year-old who would later own the business. Kirkpatrick did not own the building in which his bakery was located, and he refused to sell his name, so when Jacob and Maggie Ryals bought the business, they only bought all of the recipes and equipment inside. The name was changed to Ryals Bakery and has remained ever since. While the bakery has remained in the same location since the 1950s, it has only been threatened with closure once. Ryals said her husband had worked at Pure Oil station as well as the night shift at JP Stevens, a textile plant, but he had never worked in food service before working for Kirkpatrick. With 57 years of baking and decorating under his belt, as well as owning the bakery for 43 years, it’s no wonder that Ryals Bakery is as popular as ever. 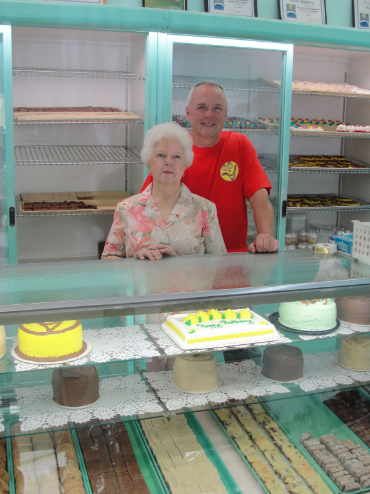 The bakery is not only family owned, but has become a family affair. Maggie Ryals is the well-known face of the bakery. Ryals said she had her first child, Kenneth, while working for JP Stevens and continued working there until her second child, Cindy, was born. She left the workforce to raise her children, but re-entered the working world eight years later when Jacob bought the bakery. The couple’s children also worked in the bakery growing up. Their daughter disliked the work and did not stay in the business, but their son, Kenneth, mostly enjoyed the work. Ryals said that while she and her husband still own the bakery, their son is the unofficial owner. He started working there in high school and is now the full-time baker and decorator. Maggie and Jacob Ryals still work in the bakery for a few hours every day. Ryals said her son’s trademark is the well-known smiley face cookies. While employees have come and gone over the years, no one has ever been able to duplicate Kenneth’s smiley design. Ryals said that because the decorating is never done by machines, it’s a specific hand movement with the hot fudge icing that delivers the familiar cookie smile so many in Milledgeville have come to love. Over the years, the bakery has gained in popularity, especially among college students. Ryals said that in the 1970s, Georgia College was not in its heyday and that few students came to the bakery. As the college and number of college students attending grew, the students started walking around downtown more often. Now, students often show the bakery to their visiting parents. The favorite of most college kids, Ryals said, is the smiley face cookies. Ryals said the bakery wouldn’t be possible without the customers and people who have stuck by the business over the years and decades. The customers’ loyalty shows — Ryals Bakery has been voted the best bakery in Milledgeville in every Readers Choice Award by The Union-Recorder. Ryals Bakery is located at 135 S. Wayne St. It is open 7 a.m. to 6 p.m. Tuesday through Friday and 7 a.m. to 5:30 p.m. Saturday. The business is closed Sundays and Mondays. It can be reached at 478-452-0321 or online at www.facebook.com/Ryals-Bakery-564146203686064.